Are there moral absolutes? Yes, so long as society submits to supreme moral authority. To which supreme moral authority do we look? Our Constitution? Declaration of Independence? Gettysburg Address? Dallas Morning News? Let’s consider material standards. Who says one ounce of gold is truly an ounce of gold? By international treaty (international yard and pound agreement of 1959) the avoirdupois ounce is THE standard throughout the civilized world. By the way, treaties become the Supreme Law of the Land for us American citizens. Thus, if someone attempts to sell you an ounce of gold that is even a fraction of a grain different from the international standard, that sale is unjust, wrong, probably illegal. The Living God, the Creator of the universe, is and was the ultimate standard of morality. Long before men and women walked the earth He, El Shaddai was. My company recently purchased two costly instruments used for critical measurements of various parameters of HVAC systems. 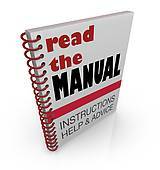 Reading the quick start guides made me to know the importance of reading and following printed instructions in the respective owner manuals to achieve the desired results. Our world has an instruction manual provided by its ‘Manufacturer’. There was no printed copy of Torah (Instruction) for the first 2448 years after Creation. In those early years, tribal leaders were few and could simply talk to the Manufacturer directly. Torahs are big and too cumbersome to carry around. As time went by, the instruction manual was bound together in convenient books that would fit just about anywhere: bedside, desktop, pocket sized, glove boxes and hotel nightstands. Collectively, we came to call this portable, bound version “Bible”. All around the world, Jews and Christians generally recognize this Instruction Manual, the Bible, as a reliable standard for everyday living and as the source for moral absolutes. Muslims refer to the Bible as “the book” and therefore call Christians and Jews “People of the Book”. Of late there is pervasive departure from moral absolutes as activists in the form of pro-abortion, “gay rights”, the LGBT-Whatever movement, atheists and communists strive to outlaw moral absolutes, but we who steadfastly refuse to throw away our up to date instruction manual get in their way. We are obstacle to be rid of. Look to Canada to see what happens when the aforementioned activists gain control of government. In Canada, the Supreme Court of Canada has ruled that “Biblical speech opposing homosexual behavior, including in written form, is essentially a hate crime.” God is ‘hate’? I don’t agree. Question of the hour: Will we choose to follow the activists, or will we choose to follow the Manufacturer’s Instruction Manual? Previous Post Are you ready for ancient history about Palestine?